Linda Ronstadt is a legend. 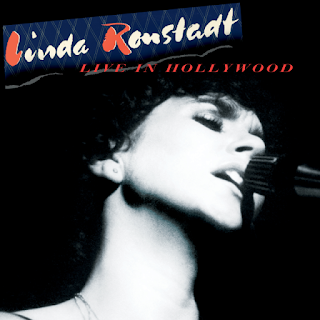 I don't really know anybody older or younger who doesn't like Linda Ronstadt. Like many males of my generation, we not only loved her beautiful voice but carried a huge crush to match. In 1980, she was at the top of her game, a bona fide rock 'n' roll star with a succession of platinum selling albums. In April of that year, she performed a live concert at Television Center Studios in Hollywood for an upcoming HBO Special. Through a friend, I was able to get a bootleg cassette tape of the entire concert and played that thing to death in my new 1980 blue Toyota truck cassette player. The concert has now just been released, Feb. 1st as a live album (view sources here) and I have delighted in revisiting these tracks with Linda and her wonderful band including, Wendy Waldman, Kenny Edwards, Danny Kortchmar, Dan Dugmore, Billy Payne, Bob Glob, and Russ Kunkel. If you ever read album jacket covers in the 70's and 80's, these guys were on everybody's records. Nobody could belt it out like Linda, and it's extremely emotional for me to see one of my teenage idols stopped in 2009 from singing and doing the thing she loved the most due to her Parkinson's diagnosis. Now at 72, you can catch up with her in her recent February 7th interview in Rolling Stone and on the TV show, Sunday Morning from February 3rd. Here is my playlist starting with the Sunday Morning interview with Linda. Then, a mix of good and poorer quality video of the concert along with the better audio tracks from the album, as sometimes the 80's tape hiss is a bit much, but I love to watch Linda perform! Enjoy my friends.